(2-3) S'rî S'uka said: 'On the first day of the bright fortnight of Agrahâyana [November-December], a woman should, with the permission of her husband, start with this vow that fulfills all desires. After having bathed, having brushed her teeth, put on ornaments and garments, she must hear about the birth of the Maruts. Then, before taking breakfast, she, according to the instructions of the brahmins, has to worship the Supreme Lord and the goddess of fortune as follows: (4) 'Let there be my obeisances unto You, oh Independent Lord [and fulfillment] of all desire. My respects for the husband of Lakshmî Devî, the Master of all Perfection. (5) Since You are the Lord endowed with mercy, opulence, prowess, glory and strength, You are the One Supreme Master of all divine qualities. (6) Oh S'rî Lakshmî, espoused to Lord Vishnu, you are His energy and have all the qualities of the Supreme Personality. I beg you to be pleased with me, oh Goddess of Fortune, oh Mother of the World. May there be my reverential homage unto you. (7) My obeisances unto the Supreme Lord and Personality of all Power who is the husband of that glory of all wealth. Him and His associates I offer my presentations'. Thus the sixth Canto of the S'rîmad Bhâgavatam ends named: Prescribed Duties For Mankind. Third revised edition, loaded December 17, 2018. 'Let there be my obeisances unto You, oh Independent Lord [and fulfillment] of all desire. My respects for the husband of Lakshmî Devî, the Master of all Perfection. Since You are the Lord endowed with mercy, opulence, prowess, glory and strength, You are the One Supreme Master of all divine qualities. 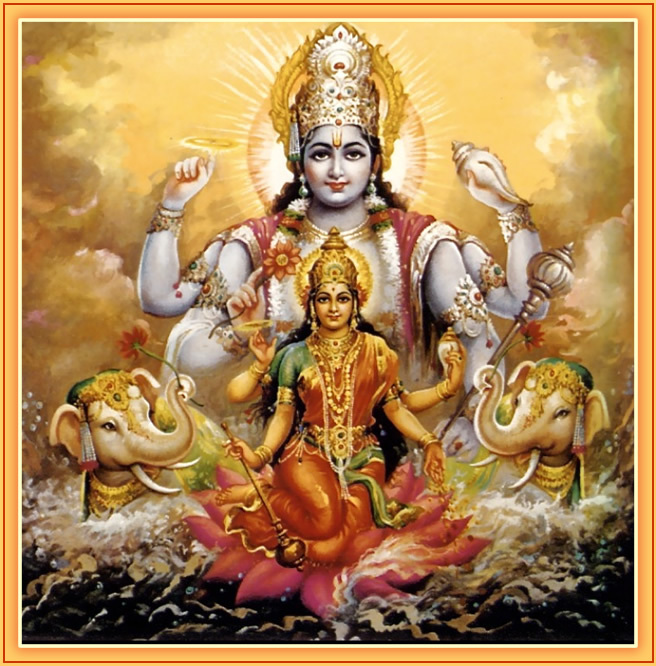 Oh S'rî Lakshmî, espoused to Lord Vishnu, you are His energy and have all the qualities of the Supreme Personality. I beg you to be pleased with me, oh Goddess of Fortune, oh Mother of the World. May there be my reverential homage unto you. My obeisances unto the Supreme Lord and Personality of all Power who is the husband of that glory of all wealth. Him and His associates I offer my presentations'. With the invocation of Lord Vishnu by means of this mantra, she every day has to offer attentively presentations of gifts, lamps, incense, flowers, scents, ornaments, garments, a sacred thread, bathing water and water for the hands, feet and mouth. My obeisances unto the Supreme Lord and Personality of all Power, the husband of that Greatness of Wealth with His associates; unto Him I offer my presentations'. Lord Vishnu and the goddess are the bestowers of all benedictions and together they constitute the source of all blessings. If one desires all opulences, one should daily be devoted with this worship. 'You two are the proprietors of the universe, the Supreme Cause. The external energy of the material world is hard to fathom, it is the deluding power that is difficult to overcome. You, the Supreme Personality, the Lord of All Sacrifices, are her direct Master. She is the [original appearance of the] performance of this worship, while You are the enjoyer of the fruits. This devî is the reservoir of all the qualities, while You manifest and enjoy these qualities. The goddess of fortune is the body, the senses and the mind, while You are the Supersoul of all the embodied beings. Lakshmî is the name and form, while You are the support and certainty. This is the way one should pray to Lakshmî and S'rînivâsa, her abode and the bestower of benedictions. After this offering one must put away the articles of worship and ritually wash one's hands and mouth. With devotion and a humble mind, one should then offer prayers, smell the remnants of the sacrifice and again worship Lord Vishnu. With these offerings the wife in utter devotion should accept her husband as the Supreme Person. The husband in his turn also should [thereto] lovingly support all the menial and elevated activities of his wife. When the wife is unable, the husband should execute it attentively, because when only one of them does so, still both wife and husband [will benefit]. One should not deviate for any reason from the [prescribed] practice of this vow to Lord Vishnu. One should daily, in a regulated manner, grant the brahmins and the women together with their husbands and children, that what remains of the offerings to the Godhead that consist of garlands, sandalwood, food and ornaments. When one in respect of the regulative principles has placed the offerings before Him and has put the Godhead to rest, one should share the remnants of the sacrificed food with others and eat them. That is how one will find one's soul purified and all one's desires fulfilled. With this regulated puja the virtuous wife must, after the time of twelve months or a year, then fast on the last day [the full moon] of Kârttika [October-November]. The next morning touching water and as before worshiping Lord Krishna, the husband must, according to the injunctions [as stated in the Grihya-sûtras], offer, with twelve oblations in the fire, sweet rice that with ghee was boiled in milk. After having pleased the brahmins by devotedly expressing his obeisances bowing down, he, having accepted their blessings on his head, then with their permission should eat. Controlling the voice, he should first of all with friends and relatives properly receive the teacher of example, the âcârya, and then give the wife the remnants of the offering. That will ensure good progeny and fortune. Performing this vow according to the instructions, a man in this life will achieve that what he wanted from the Almighty Lord. A woman performing this may then achieve all fortune, opulence, progeny, a long living husband, a good reputation and a home. The image is a popular Hindu image of the divine couple of Vishnu and Lakshmî. Source.